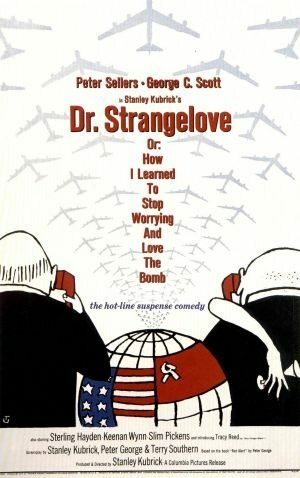 Dr. Strangelove Or: How I Learned to Stop Worrying and Love the Bomb (1964, 90 mins), is a classic Cold War film directed and produced by Stanley Kubrick and starring Peter Sellers and George C. Scott, with Sterling Hayden, Keenan Wynn and Slim Pckens. 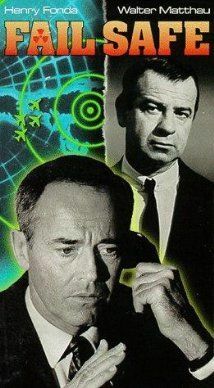 The film is loosely based on Peter George’s Cold War thriller novel Red Alert (also known as Two Hours to Doom). The story concerns an unhinged United States Air Force general who orders a first strike nuclear attack on the Soviet Union. 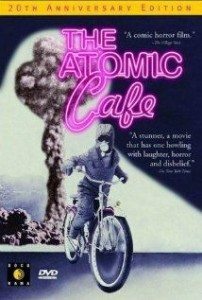 It follows the President of the United States, his advisers, the Joint Chiefs of Staff, and a RAF officer as they try to recall the bombers to prevent a nuclear apocalypse. It separately follows the crew of one B-52 bomber as they try to deliver their payload. In 1989, the United States Library of Congress included it in the first group of films selected for preservation in the National Film Registry. It was listed as number three on AFI’s 100 Years…100 Laughs list. 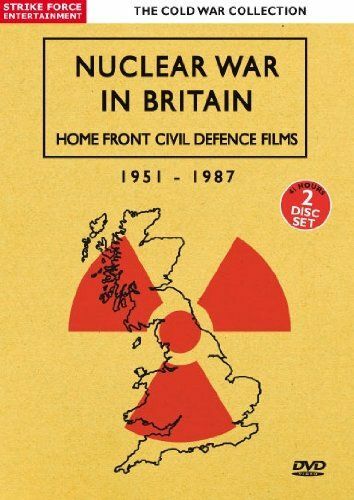 A dvd is available to borrow from Yorkshire CND. 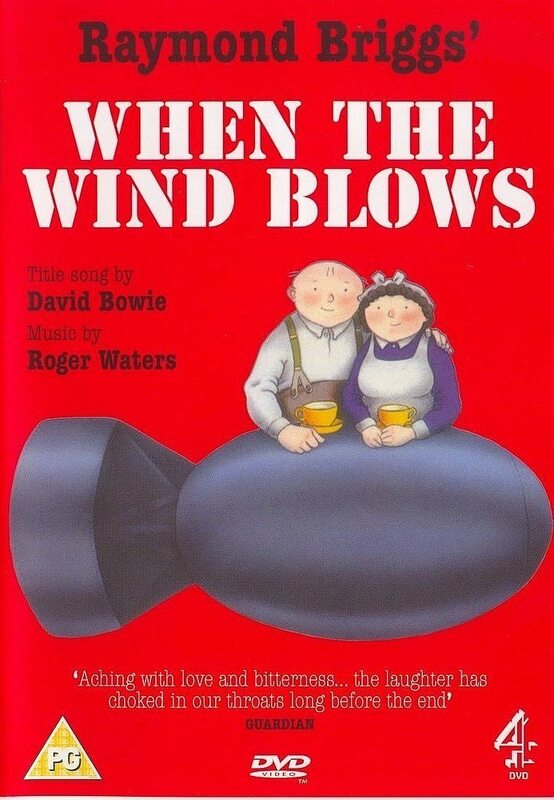 When the Wind Blows (1986, 80mins) was based on the graphic novel by Raymond Briggs and released in the UK as an animated movie. It is directed by Jimmy T. Murakami with music from Roger Waters and features the voices of Peggy Ashcroft and John Mills. 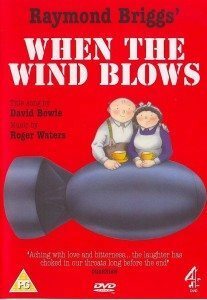 It is a harrowing account of the effects of nuclear war on a naive retired couple Jim and Hilda Bloggs. It follows them as they prepare for an impending nuclear attack by creating a makeshift shelter using a door and other household items to protect them. After the attack they emerge to find their home has been severely damaged. Devastated by the destruction they begin to pick up the pieces holding on to the belief that as in previous wars the government and emergency services will aid them and they will prevail. What ensues is a harrowing account of an innocent and naive elderly couple succumbing to the effects of radiation poisoning whilst being totally unaware of the dire situation that has befell them. When the Wind Blows is a hybrid of drawn animation and stop-motion animation. The characters of Jim and Hilda Bloggs are drawn, but their home and most of the objects in it are real objects that seldom move but are animated with stop motion when they do. An Interview with Raymond Briggs by The_IIIuminati_HunterA full version of the film is available on the internet from: http://tu.tv/videos/when-the-wind-blows-film-animation-. Fail-Safe (1964, 107mins) is a Cold war thriller directed by Sidney Lumet, based on the 1962 novel of the same name by Eugene Burdick and Harvey Wheeler. It portrays a fictional account of a Cold War nuclear crisis. The film features performances by veteran actors Henry Fonda, Dan O’Herlihy, Walter Matthau and Frank Overton. Early film appearances include Larry Hagman as the President’s interpreter. During the early 1960s, Cold War tensions existing between the Soviet Union and the United States are heightened. An accidental thermonuclear first-strike attack by a group of United States Vindicator bombers (Convair B-58 Hustler aircraft) is launched in a mission against Moscow, the capital of what was then the Soviet Union. Amidst an ordinary tour for VIPs at the headquarters of the Strategic Air Command (SAC) at Offutt AFB in Omaha, Nebraska, an alert is initiated when SAC radar indicates an intrusion into American airspace of an unidentified flying object. The standard procedure of SAC is to keep several groups of bombers constantly flying around the clock as an immediate response to any potential nuclear attack on the country. Upon an initial alert from headquarters, these airborne groups proceed to pre-identified aerial points around the globe called “fail-safe points” to await final instruction before proceeding towards Soviet targets. Shortly after reaching those points, the flying object is identified as an off-course airliner and the alert is canceled. However, a technical error sends an errant “go code” to one group of bombers, ordering them to proceed and attack their target. The 1964 version, is available on dvd to borrow from Yorkshire CND. 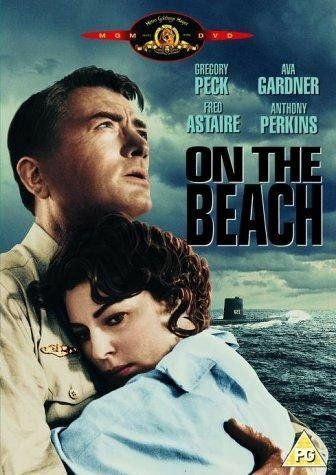 On the Beach (1959, 134mins) is an American post-apocalyptic drama film directed by Stanley Kramer and written by John Paxton, based on the novel by Nevil Shute. It stars Gregory Peck, Ava Gardner, Fred Astaire and Anthony Perkins. The story is set in a then-future 1964, in the months following World War III. The conflict has devastated the northern hemisphere, polluting the atmosphere with nuclear fallout and killing all life. Air currents are slowly carrying the fallout south. The only areas still habitable are in the far southern hemisphere. From Australia, survivors detect an incomprehensible Morse code signal from San Francisco in the United States. The last American nuclear submarine, USS Sawfish, under Royal Australian Navy command, is ordered to sail north to try to make contact with the signal sender. The sub is commanded by Captain Dwight Towers, who must leave his good friend, the alcoholic Moira Davidson. The Australian government arranges for its citizens to receive suicide pills and injections, so that they may end things quickly before there is prolonged suffering from the inevitable radiation sickness. An Australian naval officer, Peter Holmes and his wife, Mary, who is in denial about the impending disaster, have a baby daughter. Assigned to travel with the American submarine for several weeks, Peter tries to explain to Mary how to euthanize their baby and kill herself with the lethal pills in case he’s not yet home when the time comes. Mary reacts violently at the prospect of killing her daughter and herself. A dvd of the original 1959 movie can be borrowed from Yorkshire CND. 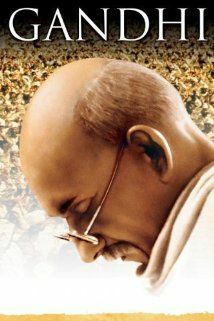 Gandhi (1982, 3hr 11mins) – an epic biographical film which dramatises the life of Mohandas Karamchand Gandhi, the leader of India’s non-violent, non-cooperative independence movement against the United Kingdom’s rule of the country during the 20th century. Directed by Richard Attenborough; writen by John Briley; starring Ben Kingsley, John Gielgud, Candice Bergen. The film was released in India on 30 November 1982, in the United Kingdom on 3 December, and in the United States on 6 December. It was nominated for Academy Awards in eleven categories, winning eight, including Best Picture. Richard Attenborough won for Best Director, and Ben Kingsley for Best Actor. A dvd of the movie can be borrowed from Yorkshire CND. 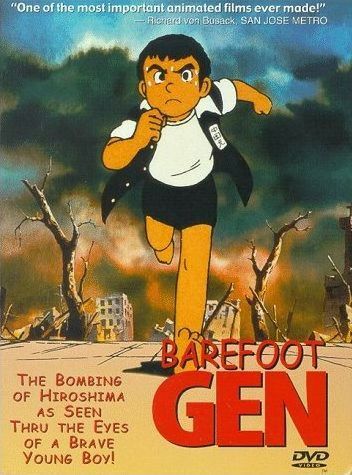 Barefoot Gen (1983, 85mins) – is an animated war drama anime loosely based on the Japanese manga series by Keiji Nakazawa and directed by Mori Masaki. It depicts World War II in Japan from a child’s point of view revolving around the events surrounding the bombing of Hiroshima and the main character’s first hand experience of the bomb. It’s the summer of 1945. 3 years have elapsed since the war between Japan and USA began. Gen is a young boy living a struggling yet satisfying life in the city of Hiroshima, that has been strangely spared by the bombing taken in almost every other Japanese City. Food is scarce, and Gen’s family is suffering from severe malnutrition, which endangeres his pregnant mother. There isn’t much spare time as Gen and his little brother Shinji help their father and mother at work and try to make sure their family survives the tought times. Little do they know, what the Americans have in store for the city of Hiroshima and as of the 6th of August 1945, their lives are about to change dramatically. A dvd of the animated film can be borrowed from Yorkshire CND. 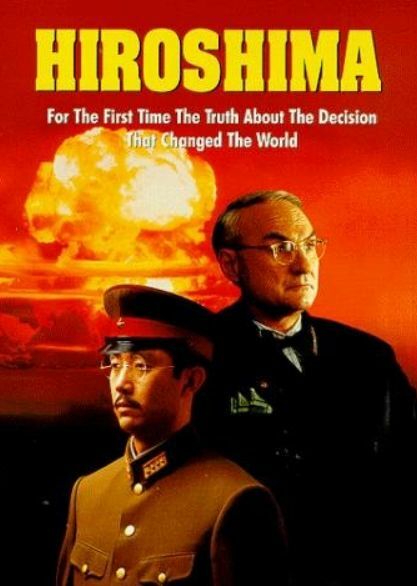 Hiroshima (1995, 178mins) – a made for TV movie in 1995 for Hallmark Entertainment, directed by Roger Spottiswoode and Koreyoshi Kurahara, they each take on their respective country’s angle, beginning from April 12th 1945 with Roosevelt’s death. Spottiswoode focusesd on Truman’s abrupt taking over the presidency – as Vice President, he’s kept largely out of the daily workings during Roosevelt’s term, and suddently is thrust into the hot seat with the passing of Roosevelt, making decisions that will affect countless of lives worldwide. Of note is the moral dilemma faced with the Manhattan Project, as well as looking into the inner circle’s politicking of racing toward being the 1st nuclear power, and the demonstration of such a might with a public display of a detonation. You’ll also see how the pilots train with mock bombs and mock targets during their countless drills just to get it right. On the other hand, Kurahara was focused on the Japanese’s lack of understanding and therefore deliberation on surrender, and takes a long hard look at how the Imperial Army dealt with impending invasion by the Allied forces. What’s to note here is the portrayal of Emperor Hirohito, as he surveys his land bombed incessantly by B29s. Politics and bickering between politicians and the military take the spotlight here. Combined brilliantly with stock archive footage, documentary reels and interviews from veterans on both sides. Hiroshima is well worth the 3 hours spent watching it, unravelling itself like a history book. 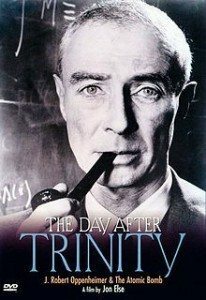 The Day After Trinity: J. Robert Oppenheimer and the Atomic Bomb (1980, 88mins) – is a documentary film directed and produced by Jon H. Else in association with KTEH public television in San Jose, California. The film tells the story of J. Robert Oppenheimer (1904–1967), the theoretical physicist who led the effort to build the first atomic bomb, tested in July 1945 at Trinity site in New Mexico. 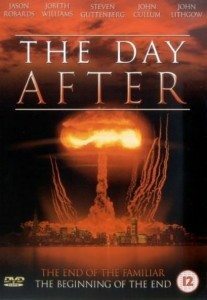 Featuring candid interviews with several Manhattan Project scientists, as well as newly declassified archival footage, The Day After Trinity was nominated for an Academy Award for Best Documentary Feature of 1980, and received a Peabody Award in 1981. “I have become death,” declared Oppenheimer upon first witnessing the terrible power of the atomic bomb. This Oscar-nominated documentary uses newsreel footage and recently declassified government film to trace the growth of the Manhattan project under Oppenheimer’s guidance. The New Mexico A-bomb tests are shown, as are the aftermaths of the Hiroshima and Nagasaki bombings. The final scenes detail Oppenheimer’s transformation from the “father of the A-bomb” to one of the most tireless opponents of nuclear power. The Day After Trinity received its widest distribution when it was telecast over PBS on April 29, 1981. 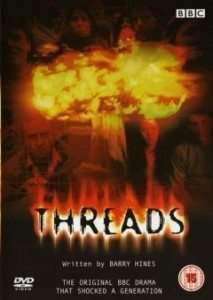 Threads (1984, 112mins) is a BAFTA award winning documentary style account of a nuclear holocaust and its effect on the working class city of Sheffield, England; and the eventual long term effects of nuclear war on civilization. Directed by Mick Jackson and written by Barry Hines, starring Karen Meagher, Reece Dinsdale and David Brierly. The primary plot centres on two families, the Kemps and the Becketts, as an international crisis between the United States and the Soviet Union erupts and escalates. As the United Kingdom prepares for war, the members of each family deal with their own personal crises. Meanwhile, a secondary plot centred upon the Chief Executive of Sheffield City Council serves to illustrate the British government’s then-current continuity of government arrangements. As nuclear exchanges between NATO and the Warsaw Pact begin, the harrowing details of the characters’ struggle to survive the attacks and their aftermath is dramatically depicted. The balance of the story details the fate of each family as the characters face the medical, economic, social and environmental consequences of nuclear war. Shot on a budget of £250,000–350,000, the film was notable in being the first of its kind to depict a nuclear winter. Certain reviewers have nominated Threads as the “film which comes closest to representing the full horror of nuclear war and its aftermath, as well as the catastrophic impact that the event would have on human culture”. 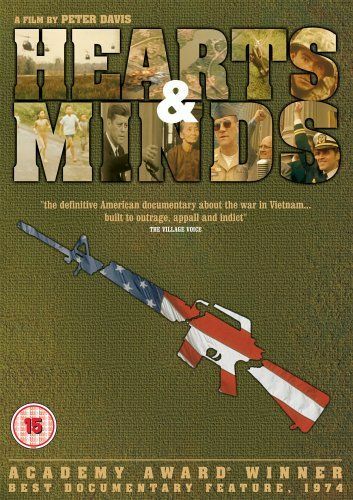 It has been compared to the earlier programme The War Game produced in Britain in the 1960s and its contemporary The Day After, a 1983 ABC television film depicting a similar scenario in the United States. A dvd of the film is available to borrow from Yorkshire CND. The Day After (1983, 126mins) – is an American television film that was first aired on November 20, 1983, on the ABC television network. It was seen by more than 100 million people during its initial broadcast. It is currently the highest-rated television film in history. The cast includes JoBeth Williams, Steve Guttenberg, John Cullum, Jason Robards, and John Lithgow. The film was written by Edward Hume, produced by Robert Papazian, and directed by Nicholas Meyer. A dvd is also available to borrow from Yorskhire CND. Cold War Collection -Nuclear War In Britain- Home Front Civil Defence Films 1951 (1987, 284 mins) – Strike Force Entertainment brings you the definitive collection of the British Government’s graphic films made between 1951 and 1987 aimed at the public to counter the imminent threat of a nuclear war. Featuring nearly 5 hours of rare archive film across 2 discs this is the definitive history of how the British government communicated the Nuclear threat to its people across four decades. As the introductory film in this set makes plain, with the dropping of the atom bomb on Hiroshima, ‘a new era in warfare was born and a new and positive approach to civil defence became a vital necessity until such a time as total nuclear disarmament provides the only real means of protecting the world against widespread destruction’. Not that you would know it from the tone of the clutch of 1950s civil defence films here, which include improbably titled shorts such as ‘Bristol Trains to Beat A-Bomb’; they show that in Britain, little had changed from the strategies of wartime and the ‘keep your pecker up, be with you in a tick’ approach. This was the era of fighting the devastation of nuclear bombs with stirrup pumps, whistles and whitewash. Many of these films have not been available for public consumption for many years making this DVD set a fantastic collectors item and a unique piece of social history. Running Time – 284 Mins FILMS FEATURED: The Waking Point (1951) / Civil Defence Newsreels (1951 / 1952) / Civil Defence Get New Gear (1955), Defence Sense (1956) / Atomic Attack (1958) / The Warden, His Duties And Training (1961) / The Warden And The Householder (1961) / Bertrand Russell Has Fear Of Nuclear War (1961) / Hole In The Ground (1962) / 700 Practice Civil Defence (1962) / Seven Civil Defence Warning Films (1964) / Care Of The Homeless (1965) / Sound An Alarm (1971) / Protect And Survive (1976) and Should Disaster Strike (1987) with a bonus feature – Civil Defence News Rushes (1952, 1962 & 1963). A dvd set is available to borrow from Yorkshire CND. Oppenheimer: The Father of the Atomic Bomb (1980, 420mins) – This 7 part BBC series is a biography of the American physicist who led the U.S. effort to develop the atomic bomb during World War II, only to find himself suspected as a security risk in the 1950s because of his increasing ambivalence about the effect of his life’s work. 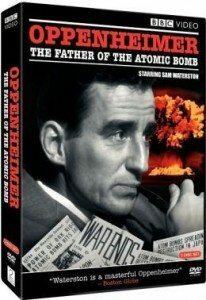 Sam Waterston starred as Oppenheimer who was among the many American scientists committed to the top-secret “Manhattan Project” of the WWII years, and, like most of his colleagues, he was eager to prove the efficiency of atomic energy as a “weapon for peace” — and to beat the Nazis in the development of the A-Bomb. But upon witnessing the first test explosion in Los Alamos, Oppenheimer realized “I had become death,” and he dedicated the rest of his life to the pursuit of peace without having to resort to nuclear armament. As a result, he became a security risk to the U.S. government, and ultimately one of the most famous and conspicuous victims of the postwar anti-communist hysteria. Originally telecast by the BBC from October 29 to December 10, 1980, Oppenheimer later aired in the United States as a component of the PBS miniseries Masterpiece Theatre . In the clip below Oppenheimer talks with Edward Teller (played by David Suchet) about the “Super” (Hydrogen Bomb). A dvd of the series is avaiable to borrow from Yorkshire CND. 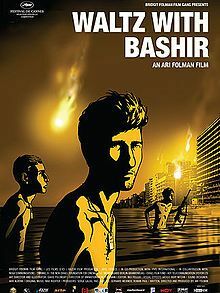 Waltz with Bashir (2008, 87mins) is an Israeli animated war documentary film written and directed by Ari Folman. It depicts Folman in search of his lost memories of his experience as a soldier in the 1982 Lebanon War. In 1982, Ari Folman was a nineteen-year-old infantry soldier in the Israel Defense Forces (IDF). In 2006, he meets with a friend from his army service period, who tells him of the nightmares connected to his experiences from the Lebanon War. Folman is surprised to find that he remembers nothing from that period. Later that night he has a vision from the night of the Sabra and Shatila massacre, the reality of which he is unable to recall. In his memory, he and his soldier comrades are bathing at night by the seaside in Beirut under the light of flares descending over the city. Folman seeks out other people who were in Beirut at the same time in order to understand what happened there and to revive his own memories. Folman eventually realizes that he “was in the second or third ring” of soldiers surrounding the Palestinian refugee camp where the carnage was perpetrated, and that he helped the Lebanese Christian Phalange militia perpetrate a massacre in a refugee camp. The film ends with animation dissolving into actual footage of the aftermath of the massacre. Waltz with Bashir has won and been nominated for many additional important awards while receiving wide acclaim from critics. It won a Golden Globe Award for Best Foreign Language Film, an NSFC Award for Best Film, a César Award for Best Foreign Film and an IDA Award for Feature Documentary, and was nominated for an Academy Award for Best Foreign Language Film, a BAFTA Award for Best Film Not in the English Language and an Annie Award for Best Animated Feature. Nuclear Reaction: How New Zealand became Nuclear Free (1995, 46mins) – Directed by Alan Erson and starring: David Lange, Norman Kirk, Linus Pauling, Robert Oppenheimer, Richard Prebble. This documentary comprehensively plots NZ’s progress from enthusiastic supporter of the atomic bomb in the 1940s to proudly nuclear free by the late 1980s. New Zealand — the birthplace of “father of the atom” Ernest Rutherford — willingly participated in British tests at Christmas Island in the 1950s (and looked eagerly for uranium in the Buller Gorge) but as testing increased in the Pacific, Prime Ministers Holyoake, Kirk and Lange voiced opposition — and Moruroa, nuclear ship visit protests and the Rainbow Warrior bombing fuelled the anti-nuclear cause. 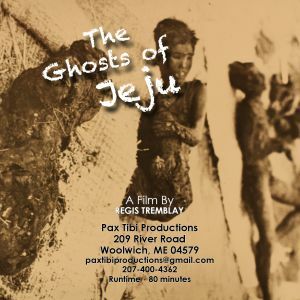 The Ghosts of Jeju: A film by Regis Tremblay (2013, 80mins) – A shocking documentary about the struggle of the people of Jeju Island, S. Korea. Set in the context of the American presence in Korea after World War II, the film reveals horrible atrocities at the hands of the U.S. Military Government of Korea. Using previously secret and classified photos, film and documents, this is the first English-language documentary about the struggle of the brave people of Gangjeong Village who are opposing the military advance of the United States, just as their parents and relatives did in 1947. As then, they are being arrested, jailed, fined, and hospitalized for resisting the construction of a massive naval base that will accommodate America’s “pivot to Asia,” and will destroy their 400 year old village and their UNESCO protected environment. Copies of this dvd can be purchased from Yorkshire CND for £8. 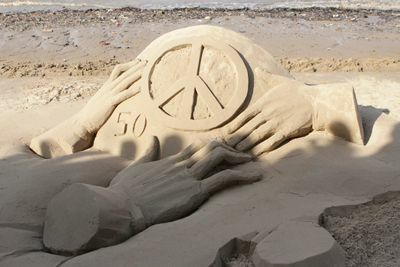 Beating the Bomb (2010, 72mins) – was made to commemorate 50 years of CND – the UK Campaign for Nuclear Disarmament. It is about the biggest weapons of mass destruction ever created, the people who use them and, more importantly, the people who fight them.’Beating the Bomb’ charts the history of the British peace movement against the backdrop of the atomic age. The film also frames the nuclear weapons issue within the wider context of global justice. The narrative follows the so called ‘nuclear deterrent’, starting at the dawn of the nuclear age in WWII to the present. Nuclear weapons shaped the power structures that arose out of the rubble of WWII and underpin them to this day. It is widely argued that the pressing issues of the day, from poverty to climate change cannot be tackled without addressing the underlying economic system and this film evidences the claim that the foundations of our economic system are ‘straight power concepts’. The most straightforward of these concepts being the bomb, both in its physical manifestation and also in the mindset it engenders and stems from. The film charts the efforts of individuals and organizations to rid Britain of its nuclear weapons system from past to present. It is a tribute to peace campaigners and accordingly features interviews with Tony Benn, Mark Thomas, Walter Wolfgang, Helen John and Vivienne Westwood, bringing into special focus the UK based Campaign for Nuclear Disarmament (CND). It is an attempt to mediate their spirit & commitment and to thus empower & inspire the viewer. Hearts and Minds(1974, 112mins) is an American documentary film about the Vietnam War directed by Peter Davis. The film’s title is based on a quote from President Lyndon B. Johnson: “the ultimate victory will depend on the hearts and minds of the people who actually live out there”. The movie was chosen as Academy Award for Best Documentary Feature at the 47th Academy Awards presented in 1975. The film premiered at the 1974 Cannes Film Festival. Commercial distribution was delayed in the United States due to legal issues, including a temporary restraining order obtained by one of the interviewees, former National Security Advisor Walt Rostow who had claimed through his attorney that the film was “somewhat misleading” and “not representative” and that he had not been given the opportunity to approve the results of his interview. Columbia Pictures refused to distribute the picture, which forced the producers to purchase back the rights and release it by other means. The film was shown in Los Angeles for the one week it needed to be eligible for consideration in the 1974 Academy Awards. The film also includes images of Phan Thị Kim Phúc in sections of a film shot of the aftermath of a napalm attack which shows Phúc at about age nine running naked on the street after being severely burned on her back. The full film can be viewed here: https://www.youtube.com/watch?v=xC-PXLS4BQ4 or a dvd borrowed from Yorkshire CND. 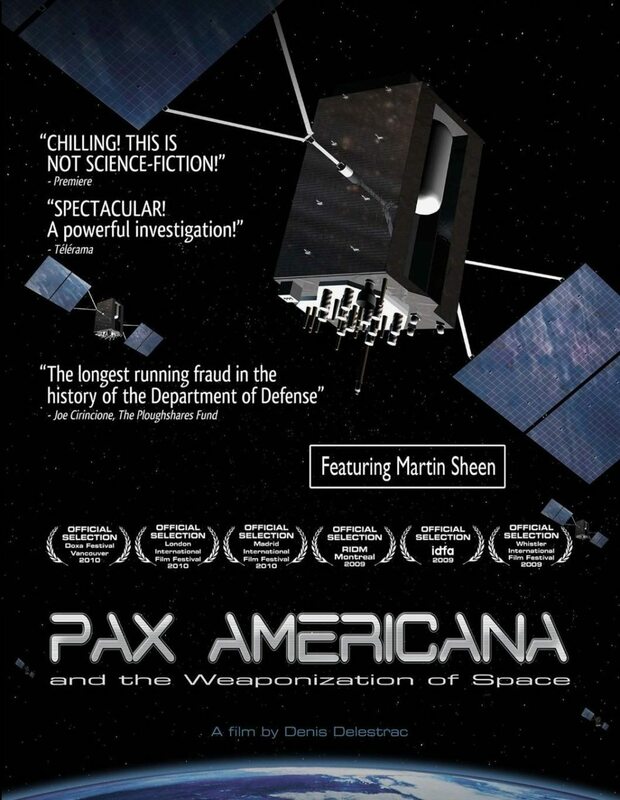 Pax Americana and the Weaponisation of Space (2009, 85mins) -from Denis Delastrac. The prospect of Earth being ruled from space is no longer science-fiction. The dream of the original Dr. Strangelove, Wernher von Braun (from Nazi rocket-scientist to NASA director) has survived every US administration since WW2 and is coming to life. Today the technology exists to weaponize space, a massive American industry thrives, and nations are maneuvering for advantage. For more details see the official movie site. 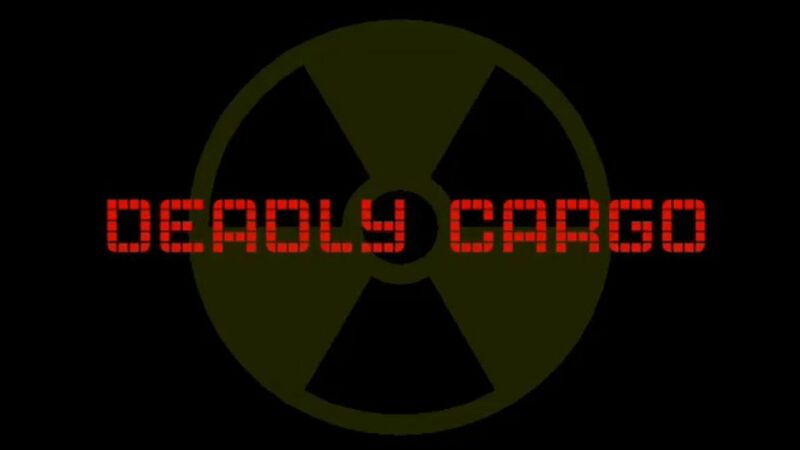 Deadly Cargo (2008, 19mins) – A Camcorder Guerillas film in conjunction with Nukewatch UK. Fully assembled nuclear convoys are regularly transported in secret convoys on ordinary roads, day and night right across Britain. The authorities are asking us to keep am eye out for suspicious looking bags at train stations. Nukewatch is asking us to keep an eye out for suspicious looking trucks carrying weapons of mass destruction on our motorways. 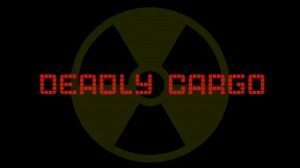 Find out the chilling truth about these lethal convoys, how they are tracked by the people in the Nukewatch network. Conflict and Climate Change (2013, 18mins) – is a dvd and a 55-page study booklet from the Movement for the Abolition of War whic makes the links between climate change, conflict and (anti-) militarism. 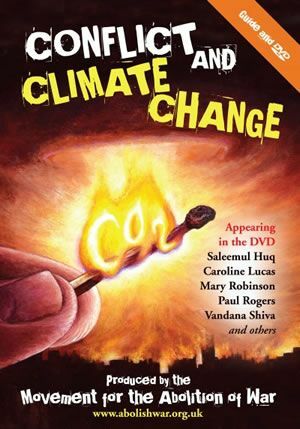 Easy to use in the classroom or study group, the dvd is split into six sections and aims to convince people that conflict and climate change are linked, and that they can be tackled together by ordinary people, communities, businesses and governments. The accompanying booklet discusses some of the major issues raised in the DVD, lists relevant organisations, explains technical terms, and gives references to other sources of information. The film features interviews with Saleemul Huq, Mary Robinson, Vandana Shiva, Caroline Lucas, Paul Rogers, Stuart Parkinson and others. The Atomic Cafe (1982, 85mins) – is one of the defining documentaries of the 20th century. It offers a darkly humorous glimpse into mid-century America, an era rife with paranoia, anxiety, and misapprehension. Whimsical and yet razor-sharp, this timeless classic illuminates the often comic paradoxes of life in the Atomic Age, while also exhibiting a genuine nostalgia for an earlier and more innocent nation. Taking aim at the propaganda and false optimism of the 1950s, the film’s satire shines most vividly in the clever image splicing, such as footage of a decimated Hiroshima alongside cheerful suburban duck-and-cover routines.